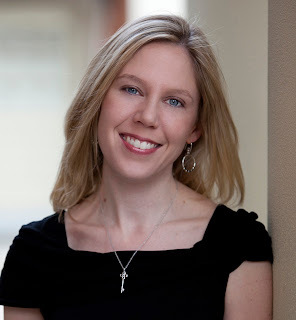 STACY MCANULTY is certain she's her mom's favorite. Her younger brother disagrees. 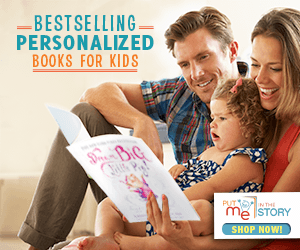 She's the author of Beautiful, illustrated by Joanne Lew-Vriethoff; Excellent Ed, illustrated by Julia Sarcone-Roach; and 101 Reasons Why I'm Not Taking a Bath, illustrated by Joy Ang. Originally from upstate New York, she now lives in Kernersville, North Carolina, with her three children, two dogs, and one husband. She doesn't have a favorite. You can find her online at www.stacymcanulty.com. 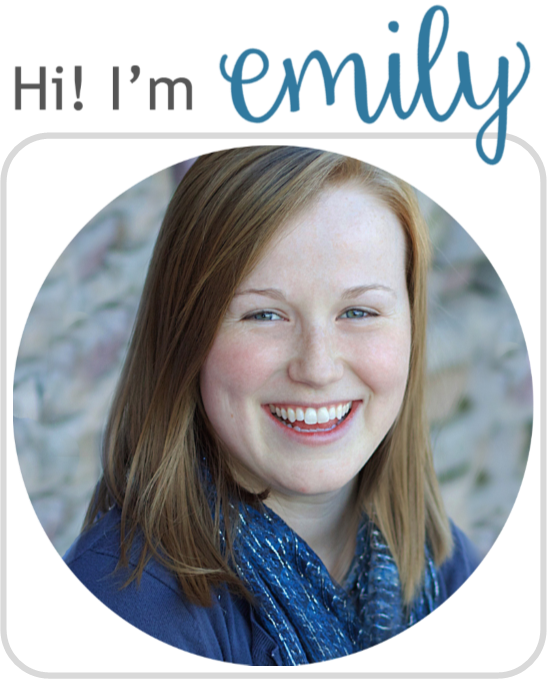 EA: Hi, Ms. McAnulty! Thanks for doing this interview. So, based on your bio, it looks like you first studied Mechanical Engineering...how the heck did you make the jump from that to writing children's books?? SM: Ha! My past career always surprises people. But engineering and writing are not that different. They both require creativity, problem-solving, and stick-to-it-ness. Sure, engineering requires calculus and physics, and writers need a comprehension of language, grammar, and spelling (none of which I’m great at). Engineers and authors are both trying to improve the world. Engineers design better cars, turbines, computers, airline seats (I designed first-class airline seats). These items mostly make our lives better. Authors create books that also make our lives better by making us laugh, think, question, dream, or escape. That actually makes a lot of sense. Tell us a bit more about the process of writing a picture book. What's the best part? What's the most tedious? For a picture book, I like to write a complete first draft in one sitting. Even if I have to force the ending. Having a finished manuscript to work with in revisions is key. Let’s be honest, my first attempt at an ending is going to be the most obvious solution. Might as well get that out of the way and move on to the truly creative, out-of-the-box conclusion. Years ago, I read about the writing team for the TV show Friends. For every joke (and there’s at least one per minute) they wrote ten punchlines. It takes time and work to get to an original idea. The best part? When I have a new project that I think is going to be awesome. The most tedious? Everything after that! I’m kind of kidding. But getting a great idea out of your brain and onto the page is not easy, at least for me. How do you get your ideas for books? Where did Mr. Fuzzbuster come from? Most of my book ideas are sparked by my kids. My son declared “I’m good at breaking stuff” and that was the seed for the plot of Excellent Ed. My son wanted a dinosaur for his birthday, so I wrote him the first draft of The Dino Files. For Mr. Fuzzbuster, it’s based on a game my mom used to play with my brother and me. We both wanted to be the favorite. So my mom would temporarily declare us each the favorite. “You are my favorite… (insert looooooooong pause) daughter.” We’d always try to cut her off before she could say daughter or son. Success is having enough time and energy (and money) to devote to the just-for-fun stuff. I think I saw that on Instagram. Because I love my job, it’s easy to spend twelve hours a day doing it. But I love other things, like food, traveling, reading, photography, dogs, and my friends and family. I’m really good at avoiding the stuff I don’t like: housework, paying bills, exercise, making dentist appointments. So it’s not too hard to make time for my favorites (activities and people). It’s the adulting responsibilities that need to be put on the to-do list or they’ll never get done. You guessed it. I don’t have a favorite dog. I love all three equally. Now, as for my kids, my favorite is…. KIDDING! Other favorites, lightning round style! Ferrero Rocher –Not exactly a bar, but it is my favorite candy. ANYPLACE with history or an amazing view (and as long as I don’t have to sleep in a tent). We try to change it up every summer. On my bucket list: Maine, Switzerland, and the Grand Canyon. Favorite fortune received from a fortune cookie? “Your creativity will lead to wonderful achievements.” This one is taped to my monitor. EDWARD HEMINGWAY is certain he's Stacy McAnulty's favorite illustrator, although the illustrators of Stacy's other books may disagree. Edward himself is the author and illustrator of the children's books Bump in the Night, Bad Apple: A Tale of Friendship, Bad Apple's Perfect Day, and Field Guide to the Grumpasaurus. Originally from Bozeman, Montana, he now lives in Brooklyn where he teaches creative writing at the master's level at SVA in Manhattan. If he has any favorite students, he'll never tell. Learn more about him online at www.edwardhemingway.com. EA: Hello, Mr. Hemingway! Thanks for doing this interview. Can you tell us about the evolution of your artistic style? What media do you prefer? EH: I love to work in oils on board, pen or pencil on paper, and mixed media with Photoshop on my Wacom Cintiq. Sometimes all together, but most often separately for each individual book I illustrate. I believe that as I’ve learned to accept and exploit my weaknesses as an artist, my personal and artistic style has come more into focus. Our limitations as artists can often bring out our strongest unique characteristics. Seems you like a bit of everything! How do you approach illustrating a new book? What gets you excited about working? Character and world building are huge for me. Also, originality. When writing my own books, I always start with some character sketches and go from there. Illustrating someone else’s manuscript can feel like less of a challenge, especially if the author or editor has already broken down the story visually on the page. So I like to push myself outside of my comfort zone and always do something different. For example, on Mr. Fuzzbuster I did the finished color art digitally, a first for me. 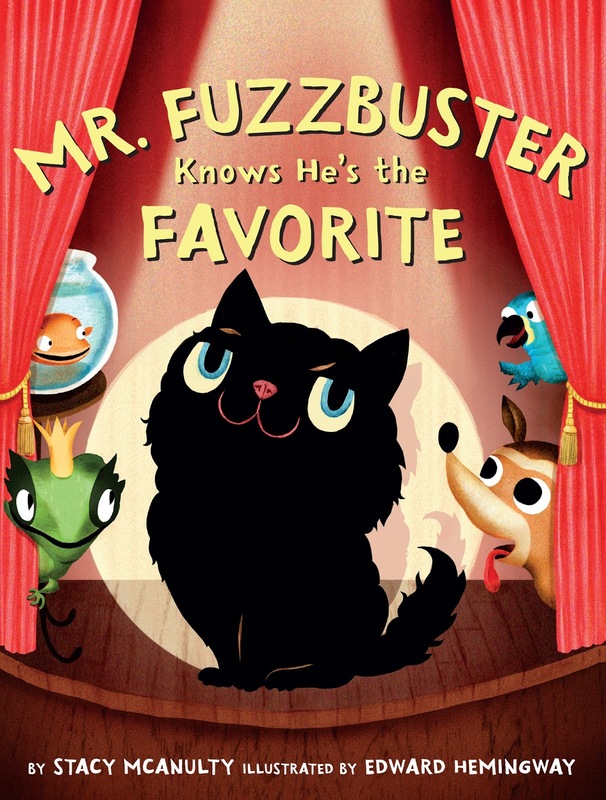 How long did it take to illustrate Mr. Fuzzbuster? Any more interesting "behind-the-scenes" stories about the process? I usually need around 3 months of uninterrupted time to complete finished art on a 32 page story. Mr. Fuzzbuster was 40 pages. A couple of decisions in the storytelling process that I got to make were fun ones, and my editor really encouraged me to have fun with the manuscript. I thought it would be cool to incorporate a stage-like setting on a double page interior when introducing some of the characters, and my editor liked it so much we ended up using the same concept on the cover art. I also thought it would be powerful to always show Fuzzbuster’s direct reaction in various close ups on the “who is the favorite” page reveals instead of simply showing him reacting with the other pets. I felt it gave the story a nice immediacy. 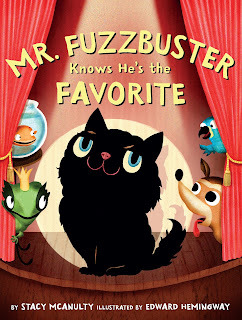 And emphasized that it was all about Mr. Fuzzbuster, of course! Thanks! I love that page too—although I give Stacy full props for that. I never would have thought to end the book on an expression that also doubles as a punch line. But it works perfectly! 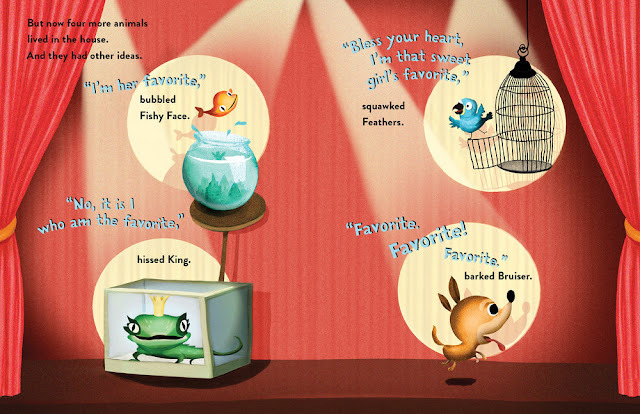 My favorite page in the book is the double page spread where (spoiler alert!) Mr. Fuzzbuster decides to leave. It’s all mood and pathos and I think it works quite nicely. They’re both integral parts of my storytelling nature. Great, thanks again for the interview, Edward! Don't forget: see below to enter a giveaway for a copy of the book, courtesy of Two Lions! Open to the US only, ends 2/22/2017. No purchase is necessary. Void where prohibited. Literary Hoots and the publisher/publicity department are not responsible for lost, stolen, or damaged items. If you are under 13, please get a parent or guardian's permission to enter. Winner will be chosen randomly via Rafflecopter after the contest ends. Winner will have 48 hours to respond to the email, otherwise, we will pick a new winner.